Mini tribal dress in printed black and white cotton-poly voile featuring cotton strings, wood beads, and black cotton fringe. 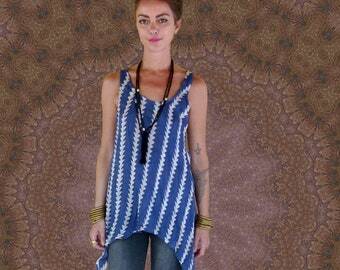 This tunic dress is a loose fit shape, cold shoulders, v neck with strings attached instead of straps. You can wear as it is or with a small top/sports bra and leggings or jeans. The fabric is slightly sheer and has a psychedelic print on it.